I should have written this a while back but oh well. 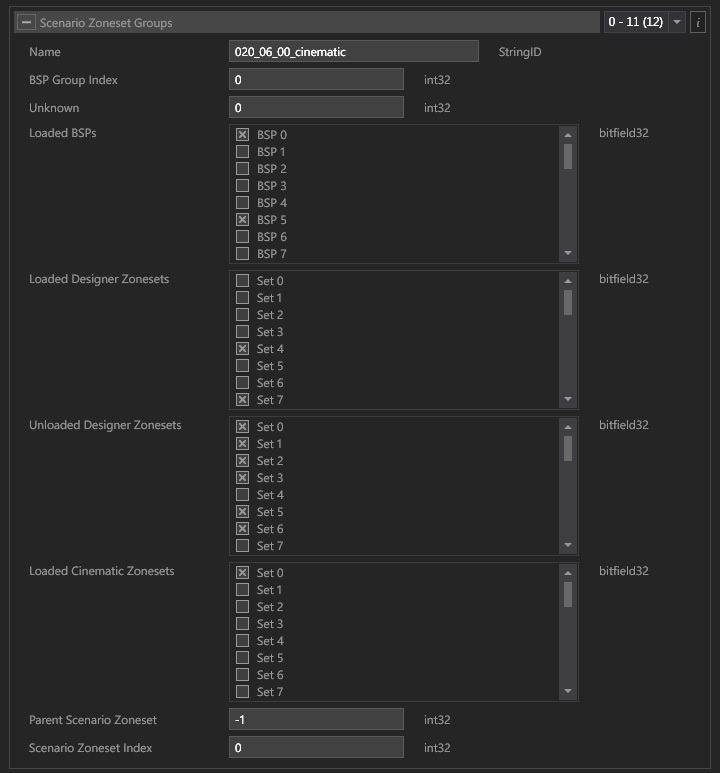 This tutorial will focus on the Un/Loaded Designer Zoneset bitfields. Basically, they are groups of objects used to selectively load in a campaign mission to save memory. 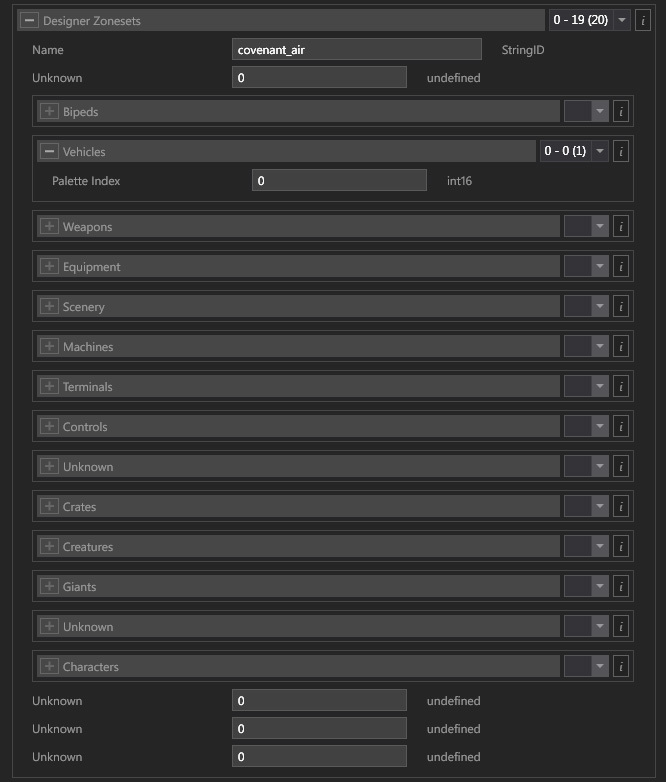 Luckily, scnr still has the import data for Designer Zonesets in it for every game (Halo 4 even has a block with the included tags referenced right there). And with that import data, we can determine where an object may be located to easily load its group. As such, this tutorial can be applied to all games, just use some common sense. The first step is to find out what Scenario Zoneset Group index you are in/want. There isn't an exact way of knowing exactly, but checking your insertion point value from the mapinfo and looking for the BSP you are in with Adjutant (refer to BSP Injection tut), then finding which SZGs have the bit for that BSP checked (check the first scnr BSP block for what bit each BSP is associated with). Once you know where you are, go through each Palette block in scnr for an object you are interested in. Palette blocks only because that's what the import info uses, but more on that when the time comes. From first glance, you see a block for each kind of object (and a couple other tags). Should be kinda obvious what to do here: Go through each Zoneset's block corresponding to the Palette you used, looking for your index to be present. The Zoneset names can be your ally here. When/if you've found it, remember what Designer Zoneset it is (or rather its index overall) and head back up to SZG. Simply check the bit for it in Loaded, and uncheck the bit for it in Unloaded. This can be poked, and will even save for gamesaves if you are into that sorta thing. But after you poke you will need to hit Start>Restart Mission in order for it to take effect. You may notice it taking an extra couple seconds to load, that's normal and intended. Your object(s) will now spawn via whatever method you wish. Halo 4's Temp Cortana on invasion, normally impossible to spawn because only the load-all method was known, which almost always overloads the map in Halo 4.